Turns out one of the best places to find small-town America… is in Costa Rica. I’m talking about Atenas in the Central Valley region in the interior of the country. Expats that have made their home here—mostly retirees—say the warm and friendly locals and a very welcoming expat community remind them of where they grew up. No doubt the innate Costa Rican emphasis on family plays a big role in that. As well as the tradition of hospitality toward new neighbors. AARP called the Central Valley one of the top retirement destinations in the world in 2010—and featured Atenas heavily. And the climate is ideal. T-shirt weather all the time. It averages in the mid-70s year-round. A few days might skew warmer and the evenings might dip into the 60s—just enough for a light jacket. But mostly it’s perfect. In the rainy season, late afternoons are wet, sometimes very. But mornings are clear. Of course, if you need further confirmation, just see the motto on the back of the town’s buses: “El Mejor Clima del Mundo”: the best climate in the world. Expats here tend to make their homes in the hills surrounding the town. The views of the surrounding coffee and sugarcane plantations, as well as forested valleys, are amazing. There are a wide variety of housing options. A three-bedroom home with a mountain view can be had for under $150,000. There are higher-end options; several gated communities have homes running from $200,000 and up. My favorite day of the week is Friday in my country town of Atenas—although since moving to Costa Rica, every day is pretty good. On Fridays, I pile all of my five dogs into the car and head early in the morning for the farmers’ market, followed by a lively off-leash hike on a forested mountain trail near town. Since temperatures rarely dip below the 70s F, we can get out and about at any time of year. Healthy living is easy in Costa Rica and is one of the things I love most about living here. My husband and I grow a lot of fruit trees and some vegetables and herbs. We give away a lot when we have a surplus, but I still go to the farmers’ market weekly to get what we don’t have. Called a feria, this market is the place to buy fresh fruit, vegetables, flowers, baked goods, dairy products and meats, plants and herbs, as well as organic coffee grown locally in Atenas. Whenever I visit my hometown in Southern California, I am always shocked at how expensive fresh produce is, especially organic products. Here in Atenas, for about $30 I can fill my refrigerator with fresh vegetables and fruits (mostly organic), plus a couple of packets of invigoratingly strong Atenas coffee. If I splurge $6, I can buy homemade Italian sausage or four homemade stuffed tamales and two creamy arroz con leche (rice pudding) cups. These will make my Costa Rican husband happy, since in my nearly 17 years of living here, I’ve not yet learned to make these culinary favorites. The farmers’ market always turns into a social event. While my dogs wait in the shaded car, I chat with my favorite vendors and with any of Atenas’ many expats who happen to be at the feria as early as I am. The active expat community is just one of the things that makes Atenas, a town of around 27,000 people west of the capital, San José, a great place to live. My husband and I moved to Atenas six years ago from the Central Pacific coast. What most attracted us then was the convenient location between the city and the beach; a cool climate that is more pleasant than on the coast; affordability; and the feeling of safety you get in a small town. On top of all that, the local Atenienses are kind, warm, and welcoming. They greet you when you walk down the street and wave to you when you’re driving. Shopkeepers are always polite and friendly, and I often chat with them about the weather, local or national politics, or how the regional football team is playing before I get around to buying something. People are happy here. They laugh and enjoy life, and family time is very important. It’s quite a change from the hectic, rapid-fire pace of life my friends and family live back in Southern California. 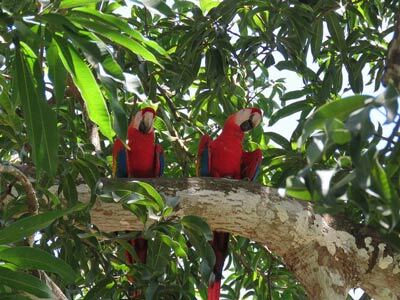 Nowhere is this more evident than in Atenas’ central park, which is lined with tall palm trees that draw flocks of green parrots or toucans. 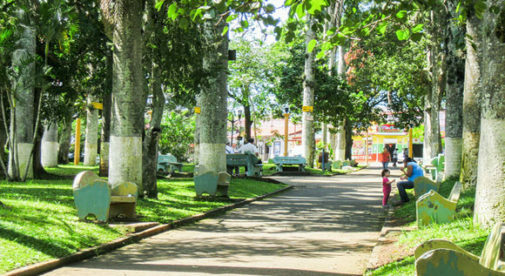 Here you can find children playing on the recently built playground, older people enjoying a rest and a chat on park benches, young people strolling along the pathways, and families out for a paseo (walk). The Catholic church borders one side and the rest is ringed by the Atenas municipal building, the national bank, shops, restaurants, and ice cream cafés. It is the perfect spot to enjoy an ice cream or coffee or simply take in local life. It’s all just part of the rhythm of life in this town I’ve grown to love. 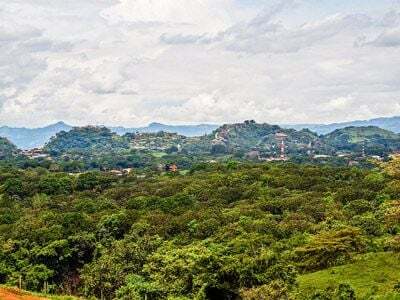 Nestled amid coffee plantations in Costa Rica’s Central Valley, Atenas rests at the edge of the central mountain range, where it drops away to the west toward the Pacific coast. Everywhere your eye falls on is beautiful, from green coffee- and forest-covered mountains to splendid valley views and picture-perfect coastal vistas. As well as coffee plantations, the town is surrounded by cattle ranches and sugarcane fields. This peaceful, rural area has a growing expat community. Atenas’ location, great weather, and small-town ambience have made it a wonderful place to retire and live internationally. Around 1,500 foreign residents from all over the world live here full-time, about three-quarters of them retirees. That number almost doubles during Costa Rica’s high tourism season, from December to early April, when part-time residents and tourists arrive to enjoy vacation homes in Atenas. The town is well located, as it’s just under an hour’s drive from San José, with its world-class healthcare and other big-city amenities, and an hour to gold- and black-sand Pacific beaches in the other direction. It takes only 30 minutes to reach San José’s international airport or the nearest large shopping malls in Alajuela (Costa Rica’s second-largest city) or Escazú (a well-to-do suburb of San José). The town likes to boast that it has the world’s best climate. Even in the rainy season, from June to November, most mornings are sunny. Since the town’s rugged terrain of mountains and valleys ranges in elevation from 2,200 to 4,000 feet, weather can be cooler or hotter, depending on where you live. Either way, you still save money, as there’s no need for air conditioning or heating. While the cost of living has risen during the time I’ve been in Costa Rica, it’s still affordable compared to Southern California. My husband and I average $2,500 in monthly expenses. We own our home and our one car, have a housekeeper who comes once a week, and go out to eat once or twice a week. Groceries, pet supplies, and household items run $600 to $700 a month, shopping at the farmers’ market and our modern CoopeAtenas supermarket in town. Rental prices in Atenas vary greatly. Rates depend on the location, how much space and luxury you want, and whether a property is furnished or unfurnished, but generally range from $650 a month up to $3,000 a month. Usually utilities, internet, and a weekly gardener are included. If you can afford it, it’s better to buy your own house. That way you don’t have to worry about leases, landlords, or rent increases over the long term. For instance, you can get a two- or three-bedroom, two-bath house on a quarter- or half-acre of land for $150,000 to $250,000. You can always rent it out as a vacation rental if you’re not ready to live in Costa Rica full-time. Renters are mostly from the U.S. and Canada who come during the northern winter months from December to Easter to escape the cold weather. Between May and August, tourists who want to see Costa Rica’s Central Valley and Central Pacific coast also look for vacation rentals here. Healthcare in Atenas also is very affordable. We have a well-equipped public health clinic, pharmacy, lab, and emergency room in the town center, next to the Costa Rica Red Cross, which provides emergency paramedic and ambulance service. If you are a member of the national public health insurance system, known as the Caja, treatment is free. Many expats in Atenas opt to use the private health clinic, Línea Vital Costa Rica, which has three ambulances. Caja membership is 6% to 12% of your reported monthly income, with a dependent spouse included. Most expats pay between $75 to $150 a month for full coverage. Several bilingual Caja physicians also offer private consultations, usually charging less than $20 a visit. Excellent, internationally rated private hospitals and national public hospitals are only 30 to 60 minutes away in Escazú, San José, and Alajuela. There are plenty of clubs and community groups to keep expats in Atenas busy. There is a men’s group, a book club, a Buddhist meditation group, a women’s club, and an artists’ group. I enjoy attending yoga classes at the Atenas Yoga Center and occasionally go out to hear the expat rock bands that play live music around town. I take language lessons in Italian and advanced Spanish at the Su Espacio Cultural Center (it also offers English language lessons). We also have a monthly English-language online newspaper called Atenas Today, for which I am a columnist. I help out volunteering at our local animal foundation, Animales Atenas, and many people volunteer at the Atenas nursing home and children’s orphanage. A popular expat hangout in Atenas for the past 10 years is Kay’s Gringo Postres, famed for its Sunday brunch. For $11, you can feast on a sumptuous breakfast buffet of smoked ham, sausages, bacon, scrambled eggs, gallo pinto (beans and rice), breakfast potatoes with onions and peppers, biscuits and gravy, fresh fruit, coffee, tea, and orange juice.